US National Olympic Trials winner, Marcus Brown shocked Japan's university student, Yoshitsuna Okada short after the beginning of the contest. The referee stopped the bout at the fifteenth second due Brown's serious head punch. It was the very first time a Japanese boxer competed in the light heavyweight class at a worldwide event. Quick-winner Brown will fight against Georgia's Levan Guledani. 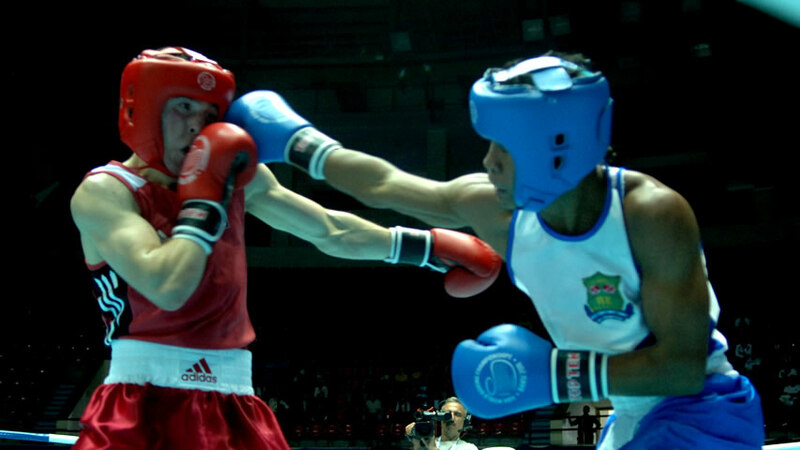 A long program of 44 bouts was held on Wednesday 28 September at the AIBA World Boxing Championships in Baku. Some boxers had to secure their place in the Top64 for the very first time in the history of the championships. Asian Games silver medallist, Chinese Zhang Jiawei advanced to the next preliminary round after beating Iran's youngest competitor, 18-year-old Armin Amjadian by 18:9 in the bantamweight class. Due to Junel Cantancio's illness, former Asian Games winner, Joan Tipon got involved in the Filipino squad just before the Championships. The veteran boxer did his best on his opening contest and eliminated South American Games silver medallist, Argentinean Alberto Melian by an extremely close 13:12. Bantamweight No.1 and AIBA Cadet World Championships silver medallist, 20-year-old new superpower Lazaro Alvarez also made his debut at the event against Beijing Olympian, Brazilian Robinelson De Jesus Vieira. The Cuban boxer had a big battle on the ring and led only by 10:8 after six minutes. But he finally raised his short advantage in the third and final round to win by 18:13 in the end. The young Cuban competitors' next opponent will be European Champion, Denis Makarov who's born in Kazakhstan from Russian parents, but he is competing for Germany. Makarov walked over to the next round because his rival from Indonesia, Korotkov Memorial Tournament quarter-finalist, Rafli Langi could not fight against him. Another Indonesian boxer failed to qualify for London 2012 on this third day, Southeast Asian Games silver medallist, 19-year-old Matius Mandiangan was defeated by Strandja Memorial Tournament winner, Bulgarian Ayrin Ismetov by 13:6 in the lightweight class' first contest. Ukraine's secret weapon in Baku is European Cup winner and University World Champion, Denis Berinchik who moved up a weight division due to his defeat against World No.1, Vasyl Lomachenko. The 23-year-old Ukrainian dominated his opening light welterweight bout against Tajikistan's current National Champion, 21-year-old Nazir Piraki and led by 23:8 after six minutes. The referee stopped the unequal contest in the third round and Berinchik advanced easily to the last 64. Japan's extremely strong fighter, President's Cup winner and Asian Championships bronze medallist, Ryota Murata demonstrated his power and stopped Argentina's newcomer, Leandro Sanchez to advance to the Top 64 in the middleweight division. European Cup silver medallist and Estonia's best fighter, 23-year-old Ainar Karlson travelled to Baku with the hope of being able to reach the Olympic quota. The Estonian boxer was leading by 6:3 after three minutes against Gagik Tsarukyan Memorial Tournament silver medallist, Greek Ioannis Militopoulos and finally won by 18:8. Pan-American Championships silver medallist and Cuba's team captain, 22-year-old Julio Cesar De La Cruz won six international tournaments last year. Therefore his clear victory over Grand Prix Usti nad Labem Tournament winner, Belarusian Mikhail Dovgalevets by 25:11 was expected. African and Arabic Champion and Tunisia's best weapon in Baku, Yahya Mkacheri had a close contest against Italy's rising star, 22-year-old Simone Fiori who suffered from only one loss this year before this fight. The North African boxer advanced to the Top 32 winning this spectacular light heavyweight fight by 13:11. Former Asian Junior Champion, Kazakh Adilbek Niyazimbetov secured his place in the national team just before the Championships that he opened with a victory over Moldova's Vladimir Cheles. The 22-year-old boxer was leading 6:4 after the first three minutes and saved his advantage until the final gong when the result table showed 16:11 to Niyazimbetov. President's Cup silver medallist and three-time National Champion, Turkmen 24-year-old Rasul Yuldashev started his participation in Baku with a valuable victory over Romania's newcomer, Georginel Hau. The final verdict of the light heavyweight contest was 17:13 to Yuldashev who will face Azerbaijan's Ramil Aliyev in the next round.